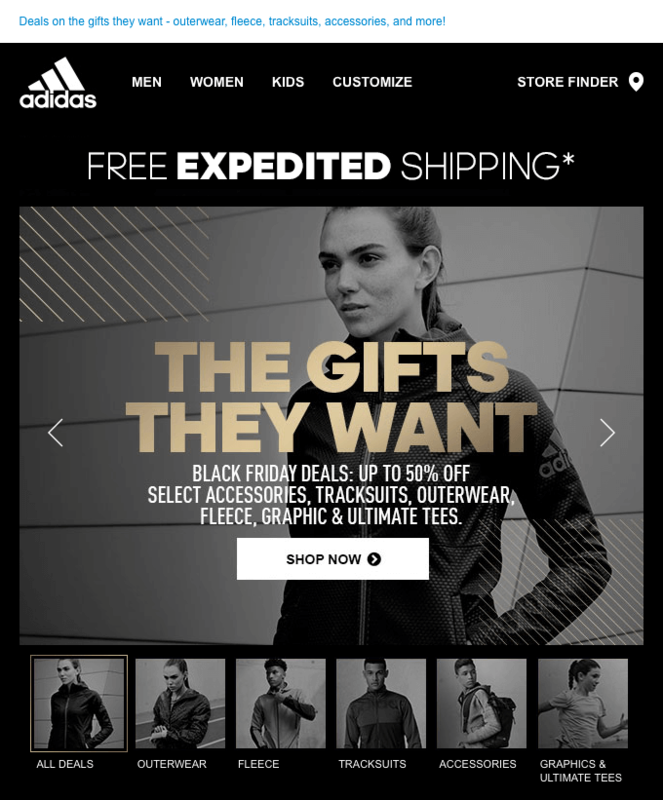 Looking for some Black Friday email examples to get you inspired for your next campaign? 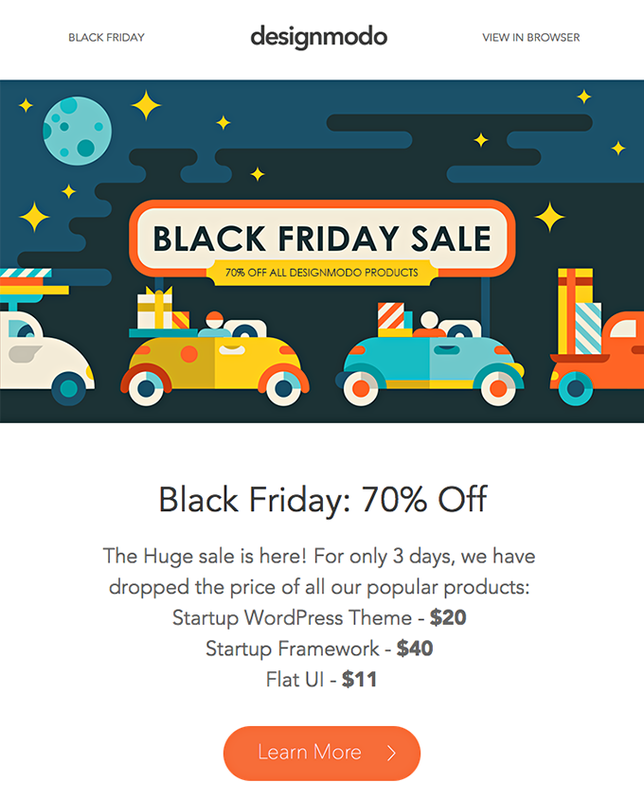 Awesome, we have prepared several great examples of Black Friday emails all set to fuel you with ideas for the design and copy of your own Black Friday email template. Black Friday is one of the days throughout the year in which clients get into a shopping mood just by hearing the phrase “Black Friday”. If you as a marketer don’t take advantage of this shopping fever that takes over people each year after Thanksgiving, well, you might be missing on quite a lot of sales. Not only people spend a lot of money on Black Friday but they even plan to do it. Since email marketing is one of the most powerful digital marketing channels to reach your leads and clients, it would be a sin not to use it for boosting your Black Friday campaigns. Consistency between text and visuals – this is something you should focus on in all your campaigns. One of the great Black Friday email examples is by BB Dakota. It shows a girl screaming supporting the main message of the email “We all scream for 50% off”. Sometimes going against the rules of design is a winning strategy. This Black Friday email template is all about black. 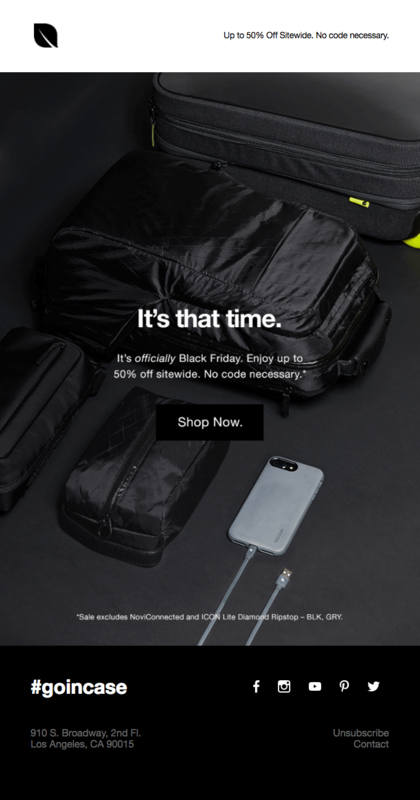 Against all design principles which claim that the call-to-action button has to be in a contrasting color to the background, Incase decided to make it black on a blackish background, thus making the whole Black Friday email black themed. Even if it’s Black Friday, this doesn’t mean you have to make your email template all black. Here is a cheerful sparkling Black Friday email example by Baublebar. 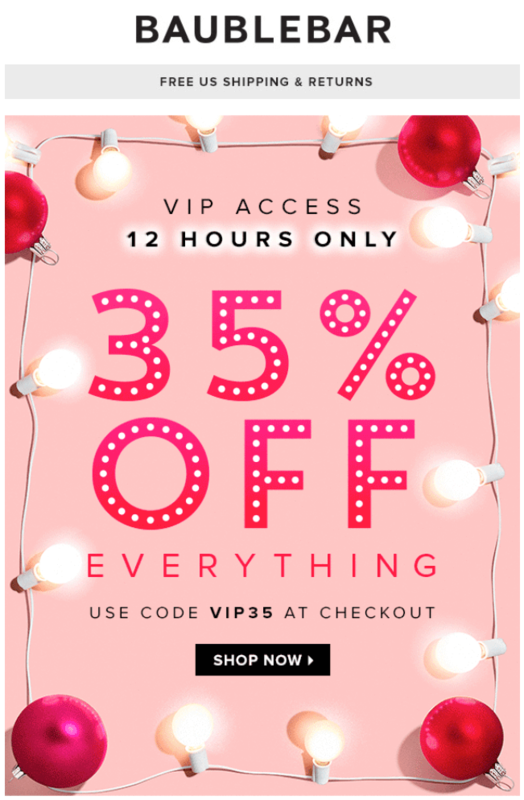 The brand put an accent on the “35% off” sign surrounding the whole message with lights. Animated email templates always manage to catch the eye more than any static template. The good news is, you don’t need to make something super complicated in order to draw attention. Here is an awesome example of a Black Friday GIF email template by Designmodo. The brand simply made the “70% OFF” sign blink which instantly draws the eye. 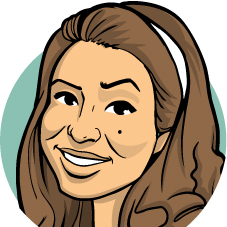 Illustrations in emails are often used to convey various concepts and emotions which couldn’t be conveyed via a photo. This great example of a Black Friday email campaign impresses with an awesome geometric illustration depicting cars full of gifts. Here is a good example of a message (“The Gift of Sleep”) supported by the visual composition. 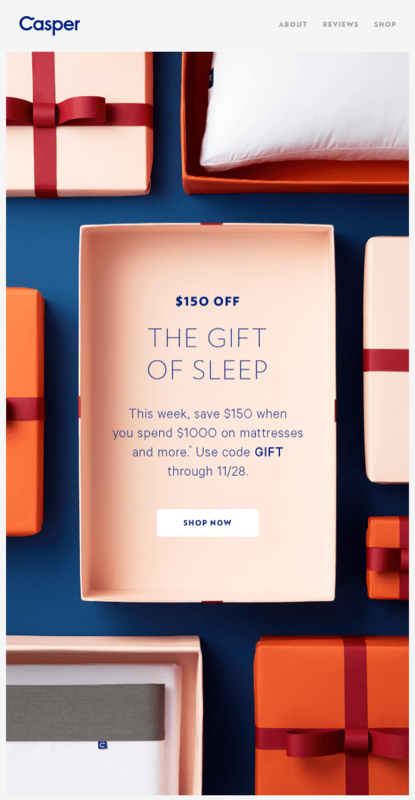 Casper sent an email template for Black Friday depicting several gift boxes, two of which including Casper’s products, and one in the middle filled with text. We already saw examples of Black Friday emails with animated messages. In this email template, Uber bet on an animated background and a static middle part where the main message was placed. Such a strategy also directs the attention towards the message in the middle because the moving background, in this case, plays the role of a frame. 8. Black Friday email GIF example by Eve. In contrast to the blinking GIF emails drawing the attention in a more aggressive way, Eve bet on a subtle animation for their Black Friday email campaign. A starry night which sparkles so delicately that it conveys relaxation. Well, having in mind that the offer is about mattresses, this animated email for Black Friday perfectly serves its purpose to put the recipients in a mood for shopping. 9. Black Friday email animation by Kidly. Black Friday is the first Friday after Thanksgiving which means it’s right before Christmas season. This is why some brands decide to give it a wintery look and put their recipients in the mood of holiday shopping. Here is a fun Black Friday email example by Kidly showing cheerful jumping penguins and falling snowflakes. Countdown timers are perfect for campaigns like Black Friday because they increase the urgency factor. 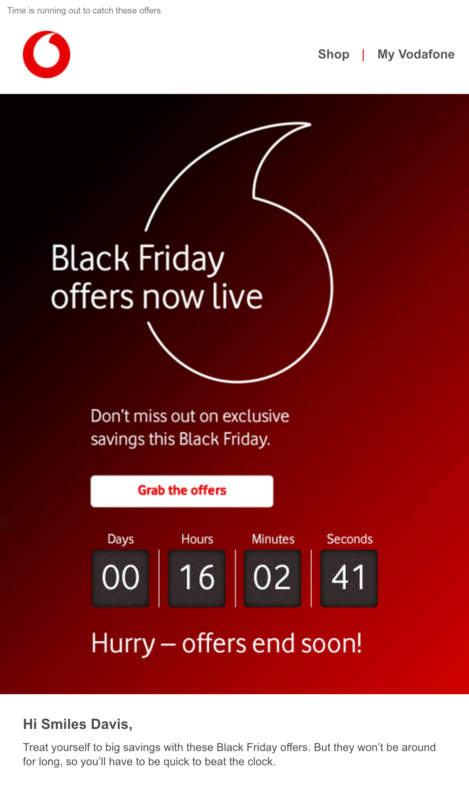 Here is an example of such a campaign by Vodafone who also added a line “Hurry – offer ends soon!” boosting the urgency even more. Vodafone set another good example by personalizing the email with the recipient’s name. A carousel in email is an innovative way to present products of different categories. The example below is by Adidas. The campaign was made for Black Friday. Besides looking totally stunning in black and white with golden elements, it gives a brilliant idea of how to present your different categories of products. Check out how it moves. If you want to impress your recipients with your email design, you should certainly follow the contemporary design trends. One of the graphic design trends for 2018 is typography elements interacting with real-life objects. Stocksy is totally rocking this trends in their Black Friday email campaign. We see another awesome trend in this template – outline elements whose outlining doesn’t match the element borders. A minimalist email design for Black Friday using just two colors: a futuristic purple on a solid black background. The design includes two curious eyes in the beginning, inclining that there is indeed something interesting to look at if you just click through. We love how this brand for lingerie connected the Black Friday event with their emblematic pink color making it sound really fresh and unique: “Pink & Black Friday”. We should also note that “exclusive” is quite a strong word for such campaigns and raises the interest of the recipient. Quite a lot of brands bet on the color black for their Black Friday emails. However, in this example by mbyM they used black lace as a pattern for the letters in “Black Friday” making the whole template look more mysterious and provocative. We love the glitter effect on this email template and we are pretty sure the female audience loved it, too. But what’s more awesome about this email is the wordplay “It’s a black out!” hinting that something so good is coming that you might even “experience a blackout”. Another good idea – take a product and write the message right on it! Well, this is what Lee did in one of their Black Friday email campaigns. They took an emblematic black jacket and “painted” the offer right on top. Right after, they placed two equal call-to-action buttons below: one for men and one for women. 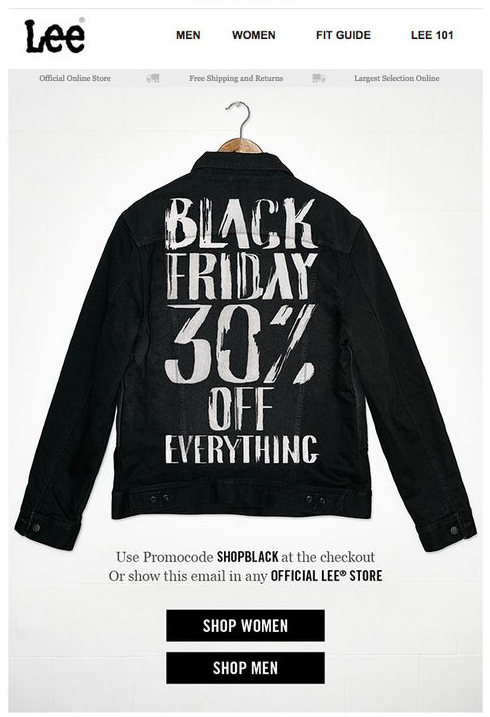 The color black is really prevailing in most Black Friday email examples. However, these emails are anything but boring! They are dramatic, witty and certainly unique. We hope you are feeling fueled with ideas for this year’s Black Friday. If you want to share your thoughts or share with us even more Black Friday email examples, we’ll be waiting for your comments below. Looking for even more Email Newsletter Ideas for November?